Another week of PAC12 football is in the history books and what a weekend it was. After the USC Trojans pulled out an exciting 48-41 win over the struggling Arizona Wildcats (1-4) Saturday, it seems all is forgiven in regards to their 43-22 loss they had against the surprising Arizona St Sun Devils last week. The USC offense seemed to be the strong point, and as the shootout continued it provided an exciting game for fans. 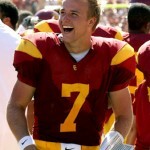 Junior quarterback Matt Barkley passed for a school-record of 468 yards and four touchdowns. Barkley’s success on Saturday allowed him to break Heisman Trophy winner and former USC QB, Carson Palmer’s 2002 yardage record. USC Sophomore wide receiver Robert Woods also made his mark by achieving a new career high of 14 catches for 255 yards. Woods set the tone for the season with 17 catches in the season-opener win over Minnesota. Unfortunately, he was just 5-yards short of All-American wide receiver R. Jay Soward’s 260-yard school record. This was USC’s weekend for sure, but let’s not forget the Oregon Ducks record night over the Wildcats last week. Running Back LaMicheal James rushed for a school record 288 yards and broke the Oregon mark for career rushing touchdowns with two scores. It’s been an exciting season by far, so should be fun to see what other records will be broken. Although USC is definitely playing up to par, they will have their work cut out for them after this bye-week. They will take on Cal and Notre Dame on the road, only to comeback home and face Stanford; who is still undefeated after beating UCLA 45-19 this weekend. QB Andrew Luck was 23-27 for 227 yards and 3 touchdowns. We will see how next weeks match-ups will top the past ones as Oregon takes on Cal, Washington State takes on UCLA, Colorado takes on Stanford, and ASU takes on Utah. As for the Wildcats, their time for redemption is now, so they had better be ready for Oregon State (0-3). This entry was posted in Advertisements, college football and tagged colorado buffaloes, oregon ducks, oregon st beavers, ucla bruins, usc trojans, washington huskies, wsu cougars. Bookmark the permalink.